Revv Up That Wheelchair - You're About to Get Krippled! These Are, Without a Doubt, the Craziest Seeds Ever! Dr Krippling has settled in & things are heating up on Gloucester Street! The UK's never seen fire like this insanely good line of 100% feminized & fully autoflowering seeds. Nothing else even comes close! Going All Out? Get The Incredible Bulk & Make It Happen! A Cerebral Mind Blower with 22% THC! Afghan Cow has enough yield to choke a very stoned horse with up to 850 gr/m2 inside or 1300 gr/seed outside. This one's beefy! Astronomical Yields & 21% THC! 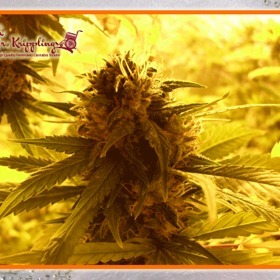 Blue Kripple is a potent 85% Indica with 800 gr/m2 yields inside & up to 1300 gr/seed outside! This is a certified couchlocker that'll leave you totally baked. 100% Sativa with 23% THC! To complete their collection, Dr Krippling created this rare 100% Sativa based on 3 incredible Haze strains with a flavour & aroma that's even better than the energetic high! Head-Spinning Speed & Krippling Highs! Dr Krippling enhanced classic Northern Lights Auto to bring you an even better version of this legendary indoor strain. Dizzy Lights Auto only needs 75 Days! Extra-Thick Crystals - Hash Friendly! Ganj of New York is a NYCD X Black Diesel mix with intense aromas, perfect bud formation & a stunning 19% THC level. Killer yields are a welcome bonus! Sour & Tangy - Delicious! Girl Scout Cookie Genetics - 7 Week Finishes! As part of Dr Krippling's highly esteemed Triple G line, this Grand Heft Auto X GSC X Gelato mix is crushing it with high yields, fast finishes and a delicious flavour that'll make you say: Please Sir, Can I have another! Up to 80 gram Yield - Each! Not only does Gorilla Infested Gelato taste great, she's got a strong, long-lasting high with a sensual edge that'll make you want to be touched all over. Ready to give her a whirl? Play This Game & Score Big! Grand Heft Auto is a magnificent strain, going off like a nuclear bomb in the last two weeks. Prepare now for rock-hard explosions of trich-encrusted buds! Win Big with 21% THC! The power is immense & the yields are massive - that makes every single Kripple Roulette Seed a bona fide winner. Order yours today! Flavour, Quality, Yield & 23% THC! Shockingly good, this 100% feminized seed combines Critical Mass bulk with Shark Shock power & Cream Caramel's gourmet flavour. Wicked good! 90% Indica with up to 1200 gr/seed! Sweet, Smooth & Utterly Devastating! The clear Blueberry flavour is soft & smooth, but there's nothing gentle about Krippleberry Auto's righteous high. It shoots right past chill & heads directly to baked! Dr Krippling's Got Your Prescription for Strong Medicine! If European genetics get your motor running, push the pedal to the metal with Dr Krippling Seeds! This relatively new breeder is a London staple, but he gets his incredible line of feminized seeds from a wide network of European connections. After all, breeding, testing, even germination is illegal in the UK - even if you have a medical marijuana degree! So how does the big doc get the job done? His family of breeders have pulled together the biggest gene pool in cannabis seed history so that every time they take a dip, they come out with a winner. Thousands of seeds are popped daily, only the absolute best of each generation are kept, and the final selection is tested over & over to ensure every last detail is absolutely perfect. There is no room for error in Dr Krippling's world! Amped-Up Features - More Power, More Yield, More Smell! Dr Krippling's strains crush it with superior genetics that boost yields & power to unheard of levels while amping up the flavour & aroma even more. This, my friends, is like weed seeds on steroids! When the news reports say that today's marijuana seeds are 10X stronger than old-school weed, this is what they're talking about. Dr Krippling does not disappoint! Looking for an amazing deal on Dr Krippling's Incredible Bulk? Or maybe you prefer Spinning Buzz Kick? Or the limited edition Gang-Nam Style? The Rhino's got you covered with the lowest prices on the net paired with fast shipping & excellent customer service. Order once & you'll see exactly what we mean - you'll be hooked! Order Your Dr Krippling Seeds Now - They're Amazing!